The sowing is behind; now is the time to reap. The run has been taken; now is the time to leap. Preparation has been made; now is the time for the venture of the work itself. — Theologian Karl Barth describing midlife. Some days I think he is right – some days I am not so sure. 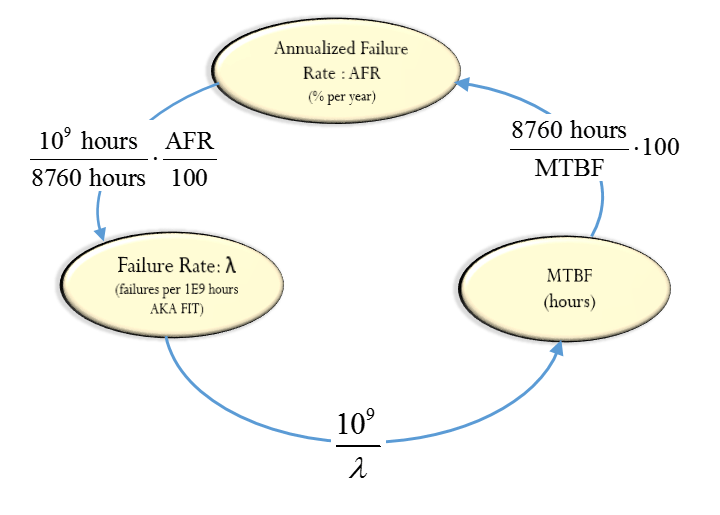 MTBF, and Annualized Failure Rate. 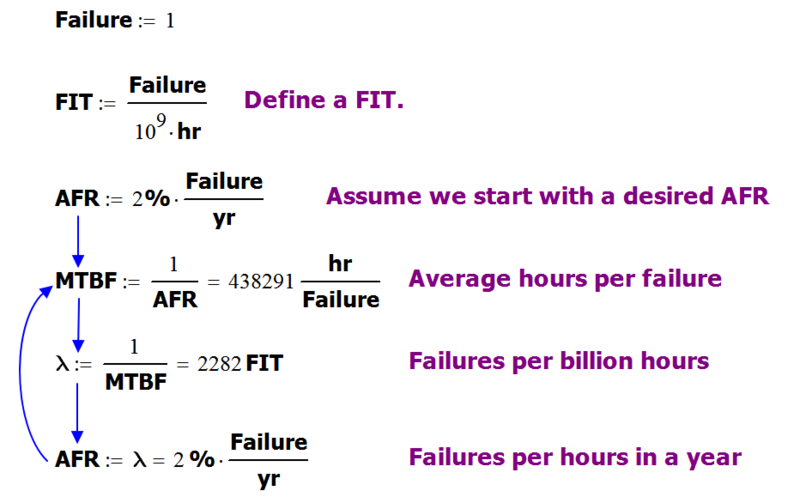 I just had another meeting where folks thought that specifications for Annualized Failure Rate (AFR), failure rate (λ), and Mean Time Between Failures (MTBF) were three different things – folks, they are mathematically equivalent. I have given up writing the formulas down as a way to explain the concept (like here). Maybe a graphic will illustrate the relationship better? I have tried this approach before – the most successful was about component temperatures. That graphic has saved me hours trying to explain how temperature limits are specified in hardware. AFR is in % per year. Figure 2 shows a worked example. Figure 2: Example of the Calculations Illustrated in Figure 1. I should mention that many computer algebra systems have the ability to handle any units you choose. Figure 3 shows an example from Mathcad. Figure 3: Example Calculation Using Mathcad's Unit System. You will note that the answers in Figure 3 are slightly different than in Figure 2. This is because Mathcad defines a year as 365.242… days. 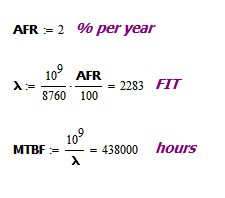 The formulas in Figure 2 assume 365 days in a year, which is a common assumption in reliability work. Things get more difficult when you start trying to explain the relationship (or lack of) between the above measures and life expectancy. People seem to start to get the message when you point out that a 20 year old man has an MTBF of about 1000 years. Excellent example! I am going to use that one.